2019 started on a high when a local group of motorcycle enthusiasts turned their love and passion for motorcycle riding into an opportunity to support vulnerable young people! 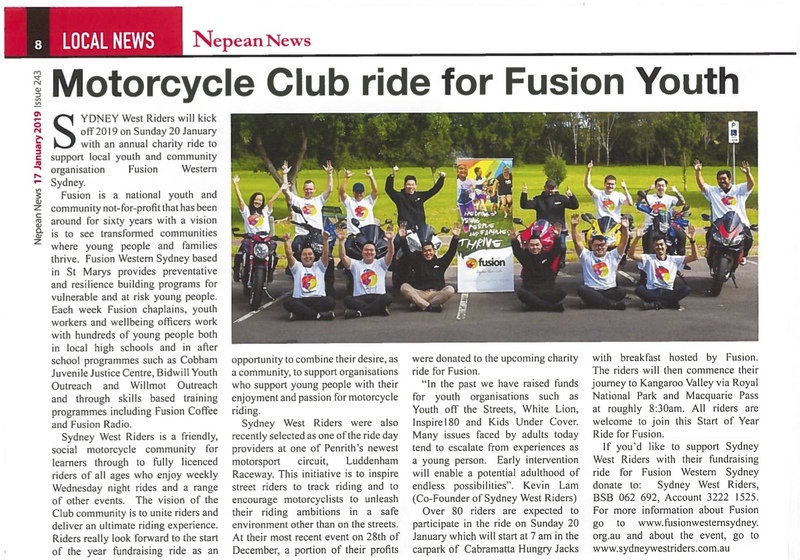 On Sunday 20 January, over 120 riders from Sydney West Riders motorcycle community took part in the Club’s annual charity ride, raising over $2,700 through donations and raffles for Fusion’s work with young people both in schools and at outreach programmes. 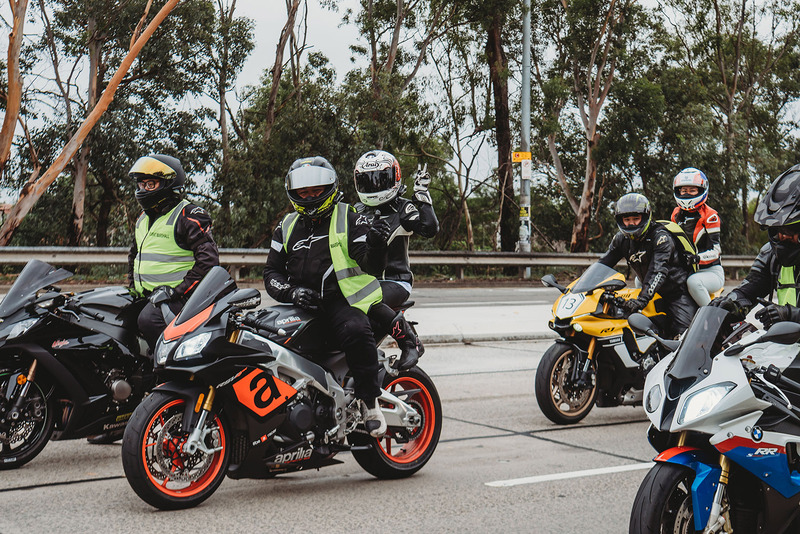 Clad in leather and helmets, with the lead group proudly wearing Fusion shirts, the group headed off early in the morning from Cabramatta heading to the Kangaroo Valley via Macquarie Pass. “Many issues faced by adults today tend to escalate from experiences as a young person. It was Fusion’s commitment to delivering creative, fun and engaging preventative and resilience building programmes to hundreds of vulnerable and at risk young people each week that caught our attention. I believe that early intervention will help enable an adulthood of endless possibilities.” – Kevin Lam, Co-Founder of Sydney West Riders. 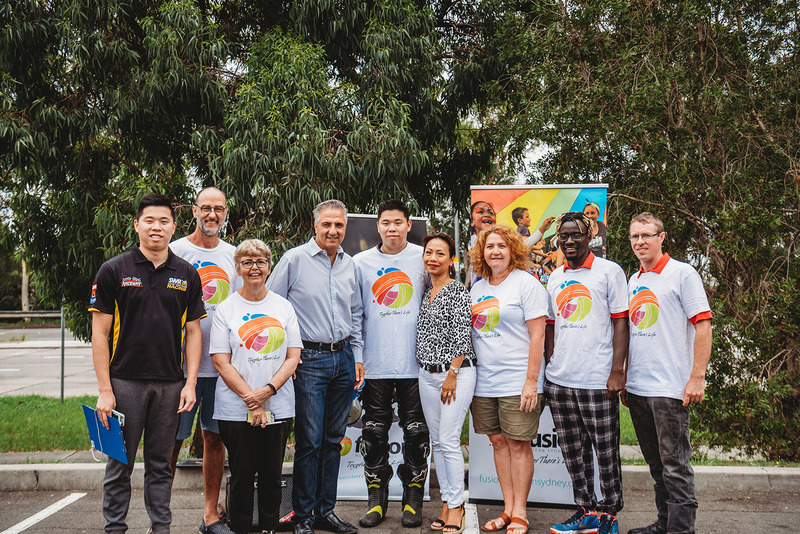 Along with family and friends in the motorcycle community, Mayor of Fairfield, Frank Carbone and Councillor Dai Le showed their support by attending the early morning bbq breakfast hosted by Fusion. 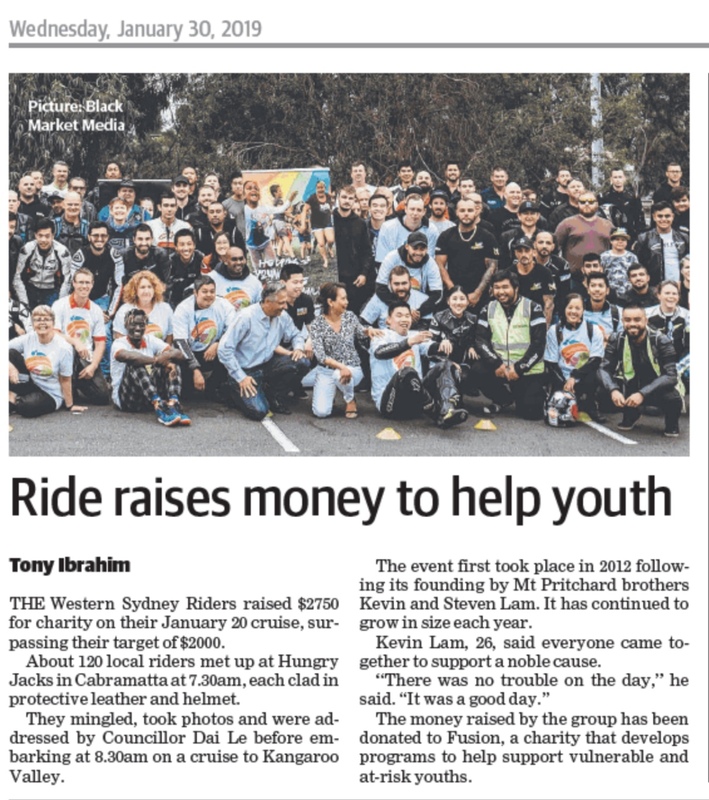 Thank you Sydney West Riders for co-ordinating such a fabulous day and showing what a partnership with those of goodwill in our community can achieve! The following stories appeared in Nepean News, January 2019, and Fairfield Advance January 30th, 2019.